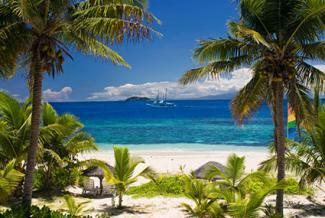 If you've ever dreamed of vacationing in a tropical paradise, the islands of Fiji embody the very idea of such a place. From pristine white sand beaches to colorful coral reefs and lush tropical jungles, Fiji is a prime destination for adventurous travelers ready to explore what South Pacific islands have to offer. From Los Angeles, a flight on Fiji Airways will get you to the islands in about 10 hours. You'll need a passport that is valid for six months beyond your stay. A four month visa is granted automatically upon arrival. Are All-Inclusive Vacations Really a Good Deal? Weather - The tropical climate stays pretty consistent year-round with highs in the 80s, but tropical storms can occur November through April. The weather is dry and sunny July through September. Prices - Peak travelling season to Fiji is July through September and this is when prices and crowds are at their highest. May, June and October are more budget-friendly and less crowded. Fiji is comprised of hundreds of small islands and two large main islands, Viti Levu, where most of the tourism is based and Vanua Levu, a more rustic destination. Fiji has a well-established network of ground transportation as well as air and water transport for inter-island travel. Tourist Transport Fiji or TTF handles the majority of ground travel on the largest island of Viti Levu, offering service from the Nadi International Airport, private transfers, sightseeing tours and coach services between the cities of Nadi and Suva. Car rentals are a good option for exploring scenic drives on the big islands. Island Hoppers Fiji offers both helicopter and fixed wing airplane transportation to various island resorts as well as scenic helicopter rides. The company has courtesy vans that will take you from international or domestic flights to the helipad. Pacific Island Air offers money-saving options using seaplanes, helicopters and fixed wing planes for Island and resort transfers, scenic tours and charter packages. Based in Port Denarau, Island Spirit Charters offers water transfers to island resorts and half and full-day charters for island hopping, diving, snorkeling and fishing trips. Sea Fiji provides fast boat water taxis to the Mamanuca Islands and lower Yawsawa Islands as well as charter trips. You can also see the islands through private or group charters on luxury yachts, sailing vessels and cruise ships, visiting numerous resorts or some of the more remote islands. Fiji offers a wide range of accommodations, from five-star luxury resorts and exclusive private villas to budget friendly hotels and rustic, family owned guest houses. Nadi is the gateway into Fiji, acting as the main hub for travelers with an international airport a few miles outside of town. A resort or hotel in Nadi makes a perfect base or sounding point for a Fijian vacation, being in close proximity to featured destinations such as Denarau Island, Mamanuca Islands and the picturesque Sun Coast. Naisoso Island Resort Villas - One of newest luxury accommodations for families or groups of vacationers, these private resort villas are located just minutes away from Nadi International Airport. Guests enjoy unlimited access to an exclusive white sand beach and a private river offering deep water access to outer islands with world-class diving, fishing and surfing. Choose from three, four or five bedroom villas with room for six, eight or 10 people. Aquarius on the Beach - Conveniently located just 15 minutes away from the Nadi International Airport, Aquarius on the Beach is a budget friendly hotel that still offers oceanfront views. TripAdvisor ranks it 5th out of 26 hotels in Nadi with consistently good reviews from guests. Amenities include an on-site restaurant, free WiFi, choice of three complementary breakfasts and activities such as beach volleyball, sea kayaks and swimming. Grand Pacific Hotel - This colonial style hotel is surprisingly the only five star property in Suva with spacious guest rooms, luxury suites and six exclusive suites with either sweeping city views or oceanfront vistas. A long list of amenities includes 24-hour reception/concierge, room service, airport shuttle, spa, pool bar, on-site golf course, five gourmet restaurants and more. Capricorn Apartment Hotel - As the name implies, rooms at the Capricorn are budget-friendly, self-contained studio apartments that include a small kitchenette, providing the option to cook your own meals with fresh ingredients sourced from a two minute walk into the heart of the city. One and two bedroom apartments are also available. The Mamanuncas are world-renowned for their idealistic tropical beauty, providing the backdrop for Cast Away, and Survivor Fiji. These showcase islands are full of resorts offering multitudes of activities including parasailing, windsurfing, scuba diving, snorkeling and more. 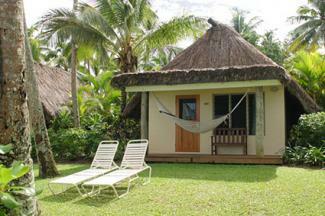 Island accommodations in Fiji are typically provided with bures, which are small cottages or cabins, and rooms in larger bungalows. Plantation Island Resort - This friendly place caters to everyone, from romantic couples to families and groups. Choose from beachside or garden bures or poolside bungalow rooms and one bedroom garden terraces. Extra sleeping cots are provided at no additional charge. Up to two kids under 16 sleeping on the existing bedding in the rooms can stay for free. Some of the activities offered include mini golf, banana boats, paddle boarding, surfing, sailing and dolphin safaris. Lomani Island Resort - From young honeymooners to retired couples enjoying their golden years, Lomani caters specifically to adults only. A limited number of 26 rooms and staff who focus on specialized customer service makes everyone feel like honored guests. 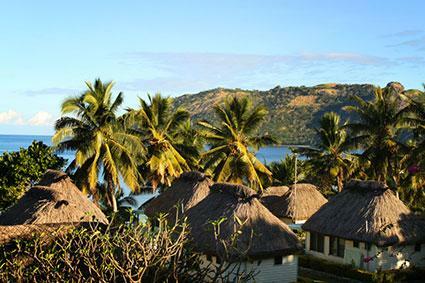 All of Lomani's 12 suites and 14 beachfront bures have spectacular ocean views. Free activities include water sports, bicycling, snorkeling and cultural lessons. With only one town and few roads, Kadavu is the perfect island escape from the modern world, where adventurous travelers can experience true Fijian culture. 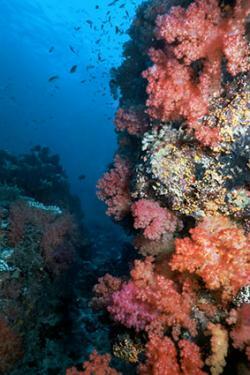 Kadavu is also surrounded by the Great Astrolabe Reef, one of the largest barrier reefs in the world. Mai Dive Great Astrolabe Reef Resort - This intimate dive resort has only five beachfront bures that can accommodate a total of 16 people. You'll be well taken care of, as this property has earned the TripAdvisor Travelers Choice Award for several years, in addition to a sixth place ranking for Best Service Hotels in all of Fiji. Enjoy guided tours of snorkeling and diving at the reef and other activities visiting waterfalls, fishing and private picnics on outer islands. Koromakawa Resort -- Here you will find total seclusion and privacy, perfect for couples or families wanting space away from other tourists. A single two-bedroom cottage accommodates one guest, couple or group at a time, with staff that caters to your every need. Dining menus and activities are tailored specifically to guest requests, who get served when they want to be served. 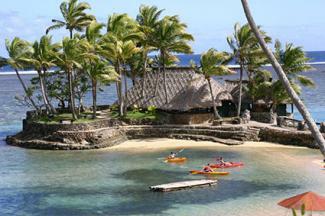 Stay busy with snorkeling, kayaks, nature walks, coconut husking, crab racing and kava ceremonies. Garden of the Sleeping Giant - Tour a beautiful botanical garden of over 2,000 Asian orchids in what was once the private sanctuary of actor Raymond Burr. Nalesutale Highland Full Day Eco Tour - Meet local villagers, then trek through a rainforest and swim in the pools of waterfalls. Ride Fiji - Stinger Bicycles - Explore the wildlife, local Fijian culture and scenic views of the Nadi Mountains on an eco-cycling tour. Whitewater Rafting & Kayaking Adventures - Rivers Fiji offers rafting and kayaking trips to both first-time novices and experienced veterans, exploring the beauty of tropical rivers, mangrove swamps and coastal waters. Parasailing - Experience what it's like to fly over the water by being harnessed to a parachute and hoisted in the air by boat. Paddleboard Fiji - For those who want to enjoy a quieter, less adrenaline-filled water activity, a paddleboard might be just your speed. Learn how to glide over tranquil waters and really soak in the beauty of the environment around you. A vacation to a location as extraordinary as Fiji wouldn't be complete without a few souvenirs to commemorate your trip. The Handicraft Center - Located in Suva near the sea wall and in the General Business District, the handicrafts center offers a vast assortment of handmade Fijian and Indo-Fijian crafts such as Kava bowls, grass skirts, Tapa (Fijian cloth) and Lali (Fijian drum). Port Denarau Shopping Centre - Located at the water's edge at the port of Denarau (Denarau Island), this outdoor shopping mall has a wide assortment of eateries, bars, clothing and souvenir shops, in addition to a bank and money exchange center and a spa, hair and nail salon. Coral Coast Full Day Tour - Experience true Fijian culture with a visit to the Nakabuta Pottery Village. Witness the pottery being made while acquiring an authentic souvenir. Then you're off to Sigatoka Town for more shopping and lunch before ending your day at Natadola Beach. Sampling the local cuisine is one of the best ways to experience Fijian culture. Fiji also has many fine dining restaurants serving international cuisine. Flavors of Fiji Cooking School - Not only do you get to sample authentic Fijian homestyle cooking and Pacific cuisine, you'll learn the art of preparing it yourself. Located on Denarau Island, about 6 miles from Nadi, classes are held from 11 a.m. to 2 p.m. Monday through Saturday. Ports O' Call - Denarau Island is well-known for fine dining, so earning first place on Trip Advisor's Best Restaurants in Denarau Island list is worth noting. The international menu boasts delicacies such as Classic French Bouillabaisse with reef lobster and Filet of Beef Wellington. Maya Dhaba - Forbes Travel Guide lists this Indian restaurant in Suva as one of the five best restaurants in Fiji, offering a large selection of curry dishes, biryani and tandoori dishes and vegetarian masala dosa. The complexity of a Fiji vacation can be a bit overwhelming. The friendly desk staff at most resorts are happy to help with transport scheduling and local tours. You may also want to contact a travel agent who specializes in Fijian vacations to help you with your travel arrangements.